Sittwe (AsiaNews) – Displays of renewed friendship between Rohingya Muslims and Rakhine Buddhists are a sign of hope for the western State, which has been affected by a serious humanitarian crisis. Although it is widely believed that the difficult relations between these two ethnic groups are the cause of the sectarian violence of August 2017, many Rohingya chose to stay in Myanmar rather than flee to Bangladesh, and are currently living in camps for internally displaced persons (IDPs) set up before the latest conflict. "Many humanitarian organisations are recruiting local people, Rakhine and Rohingya, to start their projects,” said a member of the Capacity Development Foundation, who chose to remain anonymous for security reasons, speaking to AsiaNews. “They hire teachers and introduce education programmes, from elementary schools to university education for both communities,” the person added. "Mistrust and political tensions are still widespread in Rakhine, but it is good to see so many initiatives in the state, from (the state capital) Sittwe to the border with Bangladesh. Although we receive international pressures, such as the threat of economic sanctions from the European Union (EU), we are convinced that we can build a future of peace and development in Rakhine ". After Myanmar and two United Nations (UN) agencies, UNDP and UNHRC, signed a Memorandum of Understanding (MoU), many assistance programmes got underway in Rakhine. 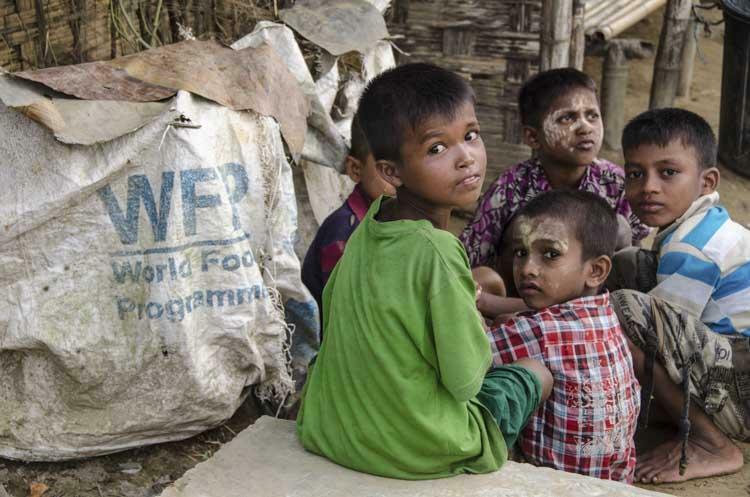 The World Food Programme (WFP) distributes food on a large scale in the state’s refugee camps (pictured). Other initiatives are underway to build and renovate housing. In addition, maintenance and infrastructure development projects have started. Assistance is not only for Rohingya and Rakhine, but also for other ethnic minorities, like the Myo and the Kamar. These programmes are designed to facilitate integration and reconciliation between the different communities. "In the coming months, the UN agencies and many civil society organisations (CSOs) will start the Cash for Work programme, thanks to which some basic infrastructures will be built," said the member of the Capacity Development Foundation. "Before implementing these pilot projects, we conducted some public consultation meetings with Rohingya and Rakhine sitting together. Friendship and reconciliation have been built and renewed during and after such meetings. However, much work has yet to be done, but seeing these initial improvements is encouraging."